Welcome to Mexico! Chilli Gold by Lightning Box Games is a bright and exciting slot, which brings a Mexican flair to your desktop or mobile device and offers some great features along the way. The game has 40 ways to win and includes a stacked wild symbol, making it easier to get big wins. Read this Chilli Gold slot review to get more information on our rating. Tired of reading? See the Chilli Gold screenshots below and then claim one of the bonus offers of our recommended casinos to play for free or real! The slot has a cartoonish design and includes some fun sound effects – offering a very immersive slot experience. Chilli Gold consists of 5 reels and 4 rows, like most other slot machines by Lightning Box Games, and features a total of 40 paylines. Up to 5 credits can be bet on each payline, and credit values range from 0.01 to 1. The wild and scatter Red Chilli symbol, which appears on reels 2, 3, and 4, can replace any other symbols in the game. Six Red Chillies unlock 3 free spins, but players may even unlock up to 21 free spins by hitting 12 Red Chillies. The game can be tested out using the free play mode, easily to be found on the Internet. Please note that the game does not feature a progressive jackpot. The Red Chilli wild and scatter symbol is the most special feature of this video slot. 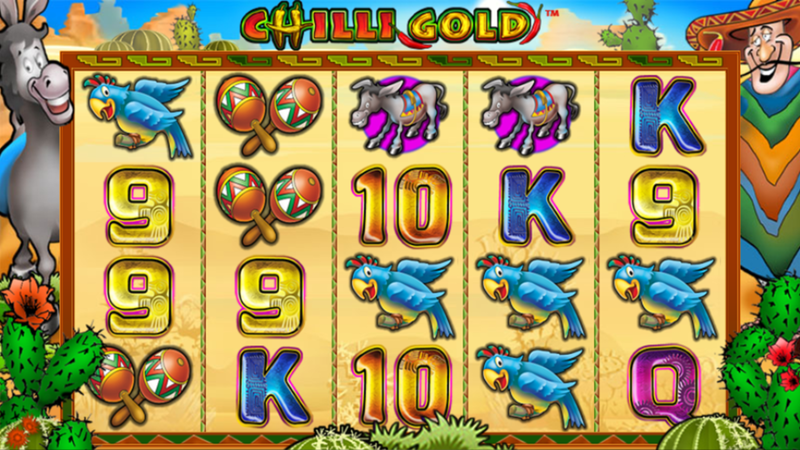 What is more, an additional wild symbol is unlocked during free spins – the Gold Chilli. This chilli is even more valuable than the Red Chilli and appears stacked on reels 2, 3, 4 and 5. No, there are no problems when playing on a mobile device. The game does not have a downloadable mobile app, but it can be played using the web version. 3. What is the RTP factor of Chilli Gold? The theoretical return to player (RTP) of this slot should be approximately 96.93% – so players expecting big wins may need to be patient and invest some time in the game. Chilli Gold is a well-designed slot that has all the features players would expect from a basic slot. Its stacked wild symbol and the free spins are quite rewarding, but the game does not offer multipliers or a bonus game, so players looking for those features may need to find another slot.